May is a big month in my family -- we have 3 birthdays to celebrate, plus mother’s day. Since we all have busy schedules and I don’t live in the same city as everyone else, we have started celebrating all of the holidays during one big weekend bash. And if you’ve learned anything about me by now you should know -- my family celebrates with food! We gathered on the long Memorial Day weekend to put together a family feast. It was the perfect day for a barbeque. Temperatures in the mid-70’s, sunny with a breeze to keep us cool, I spent a lot of time on the porch in a swing with some pomegranate iced tea and a cat in my lap. The rest of the day was spent cooking. My two sisters and I prepared the bulk of the meal and encouraged our parents to sit down and enjoy the sunshine. We grilled almost everything -- a huge batch of summer vegetables from the farmer’s market, 2 marinated tri tips, and a fillet of salmon so big it must have been half of the fish. We also had some Persian sabzi poloh, which is basmati rice cooked with fresh dill and Italian parsley, with fried potatoes cooked in. For dessert we had homemade ice cream sandwiches in flavors like salted caramel and cinnamon horchata. It was a very good day. 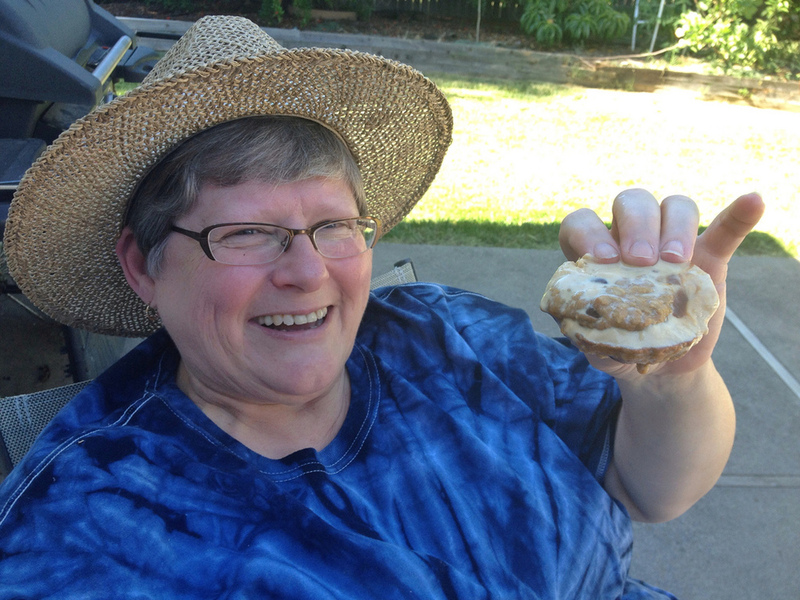 My mom loved the ice cream sandwiches -- happy birthday everyone!